If you love a classic floral pattern, this is the design for you! 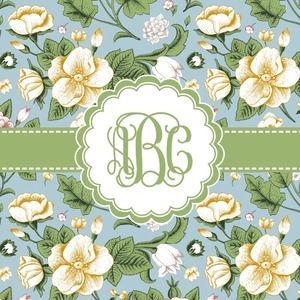 The vintage flowers in this design are cream colored magnolias, surrounded by olive green leaves on a demure blue background. The design has a classic ribbon in olive green trimmed in white. The decorative scalloped label is in white and is the perfect place for your monogram for that personal touch to pull the entire design together.